You know, I LOVE that I live in a place that allows me access to some of the coolest succulent gardens around. We’ve already visited one of my FAVORITE places, Ganna Walska’s Lotusland in Montecito, CA – now we are trotting around the cactus and succulent gardens at the Huntington Gardens in San Marino, a bedroom community of Los Angeles (did I really just write ‘Bedroom Commmunity? I don’t even know what that MEANS…). strolling down a prickly path - how cool is THIS? The Huntington has many gardens – a lovely Japanese Garden, a rose garden, water gardens … but I have to be honest – I NEVER get past the Desert Gardens. I just get stuck there! The collection of cactus and succulents is out of control, and I feel like a kid in a candy store. An odd candy store; devoted to the weirdest, stranger denizens of the plant kingdom! MY kind of plants! does this or does this not look like a mini version of the Alien monster? speaking of monster- check out THIS guy! I call him sigmund. 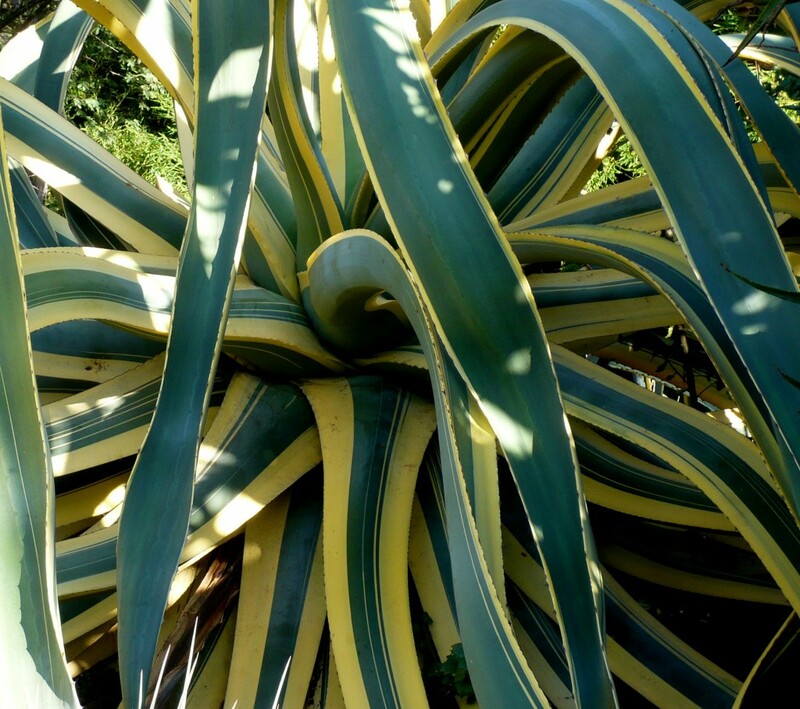 One of my favorite Agave specimens at the Huntington is a HUGE Agave americana marginata that is so contorted and twisted upon itself that it doesn’t even look like a plant anymore – it’s a gooey, writhing mass of tentacles. It’s a Sea Monster. this agave franzosinii is pretending to be a praying mantis. that, or it has bucked teeth. 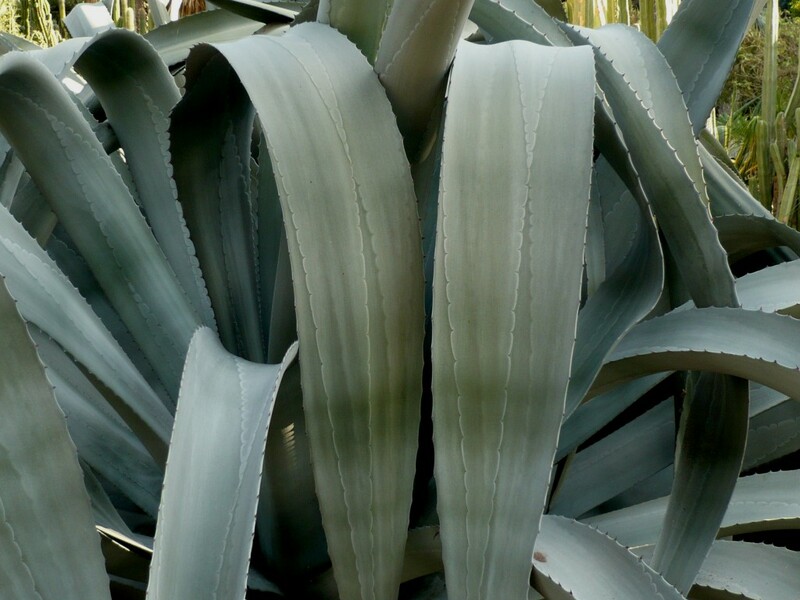 Look at the brocade-like imprint the ‘teeth’ make on the leaves of THIS agave! 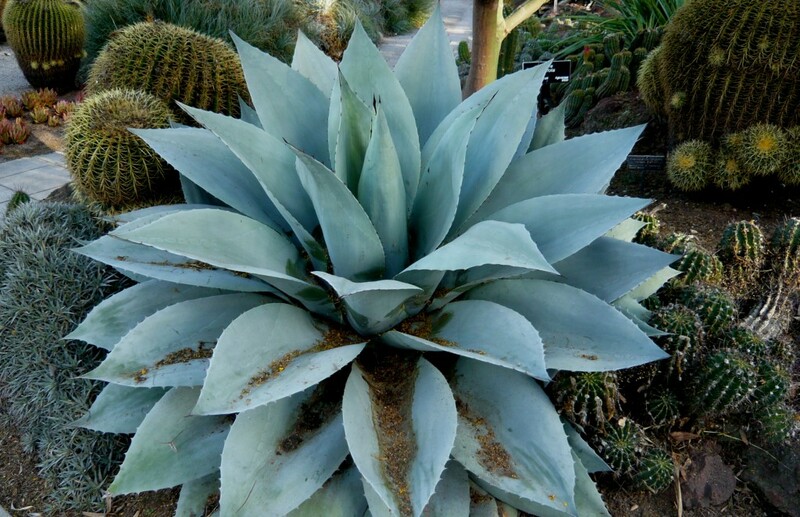 Debra Lee Baldwin wrote an amazing blog entry in Gardening Gone Wild about her love for the “Fanged” Agaves – a MUST read. I command you – read it NOW. 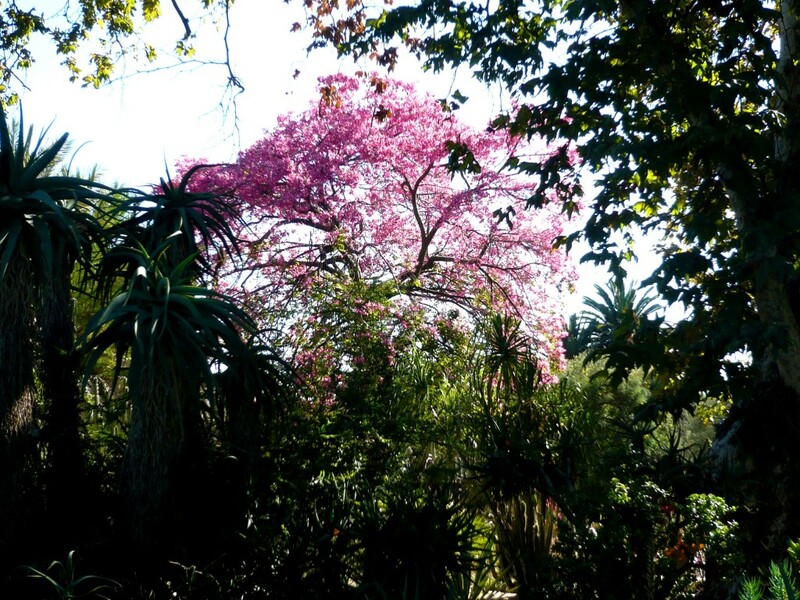 The Huntington is a very generous garden – there is so much to look at, and so many of the specimens are very old and bigger than I’ve seen almost anywhere. These collections of Agaves, Aloes, Cacti, and other desert plants are used for research – here is where some of the best new varieties come from – and here is where more is learned about the varieties we already have. does this look like a whale's tongue to you? it is ... the agave version. The Agave ovatifolia they have are so big and gorgeous! I’ve had two in my ‘nursery corner’ (otherwise known as my “plant graveyard”) for well over year, and have finally planted them in my front yard. They are so puny right now, but are destined to look like the gorgeous agave above. Whenever I see these amazing Whale’s Tongue Agaves I think of Pam from Digging, who has such a beautiful one … she loves it to pieces. When she moved to a new home, she carefully dug it out and tenderly transported it to a bed that she had all ready to receive it. THAT’S Agave love! Because moving around big agaves is hard, pointy, pokey work! The Ceiba (formerly known as Chorisia) is one of my all time favorite trees because of its green, thorny trunk – but here you see another wonderful attribute – gorgeous, orchid-like flowers that emerge after the leaves fall, so the tree looks like hundreds of big pink butterflies landed on it and made it their home. After the flowers fade, those that get pollinated swell to papaya sized proportions and then explode into enormous silky cotton puffs. Hence its common name – Floss Silk Tree. LOVE! 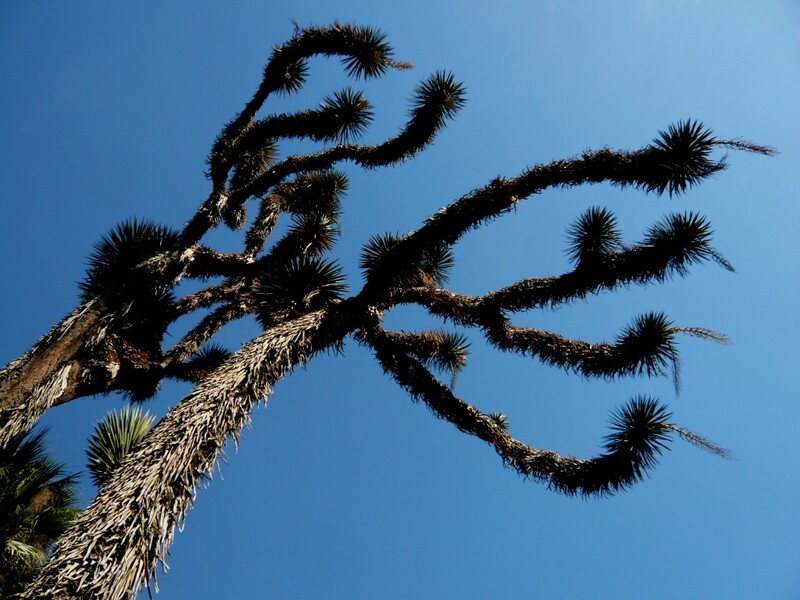 Lately, I’ve been MAD for skinny vertical cactus, like Cleistocactus. These are Cleistocactus samaipatanus, and those blooms all pointing in one direction make me CRAZY!!! I want a big berm full of them, happily pointing and blooming and being their cutely spiny selves for me. Verticals are fabulous exclamation points in a garden, and these tall skinny ones are a great way to start introducing cactus into your dry plantings. When I first became a garden maniac, I thought nothing about succulents – too deserty and dry for me – I wanted cottage-y lushness. 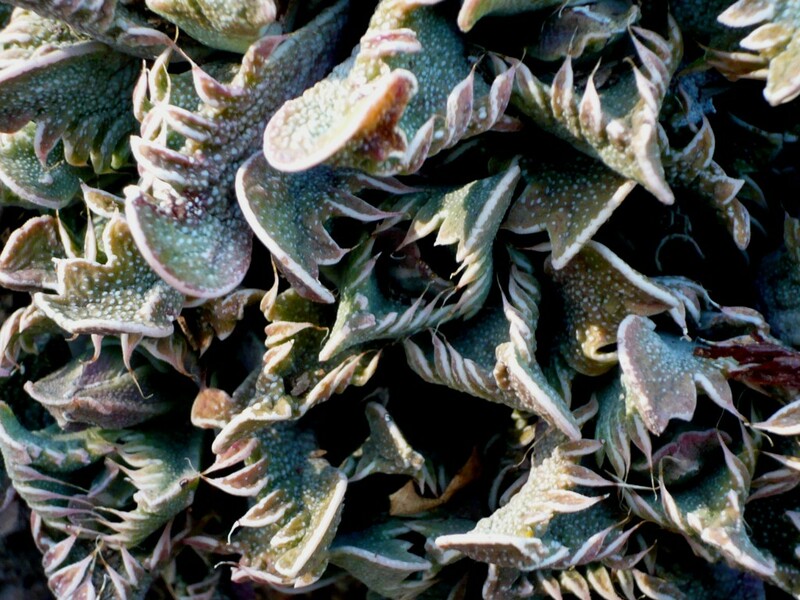 Then the succulents started working their magic on me and I enfolded them into my palette, but I kept cactus at a distance … “too strict, too harsh – not my kind of thing…” but sure enough, I am falling for them! Although falling for these, the spiniest of all, can be prickly and painful – I’m just going to close my eyes and jump, and make sure Jan has some good tweezers and a magnifying glass on hand for the inevitable extractions’ that are in my future! Being able to come to this garden and walk around whenever I need a bite of inspiration is crucial – I can see that these particular kinds of plants become grander as they age; they develop personalities, so designing with them and placing them in landscapes shouldn’t be done lightly. A tree aloe might seem perfectly appropriate when it is a teenager with a few well-developed heads on it, but they grow to tyranosaurus rex proportions, and need to be owned by someone who appreciates their brooding, looming presence. a HUGE yucca - talk about looming! 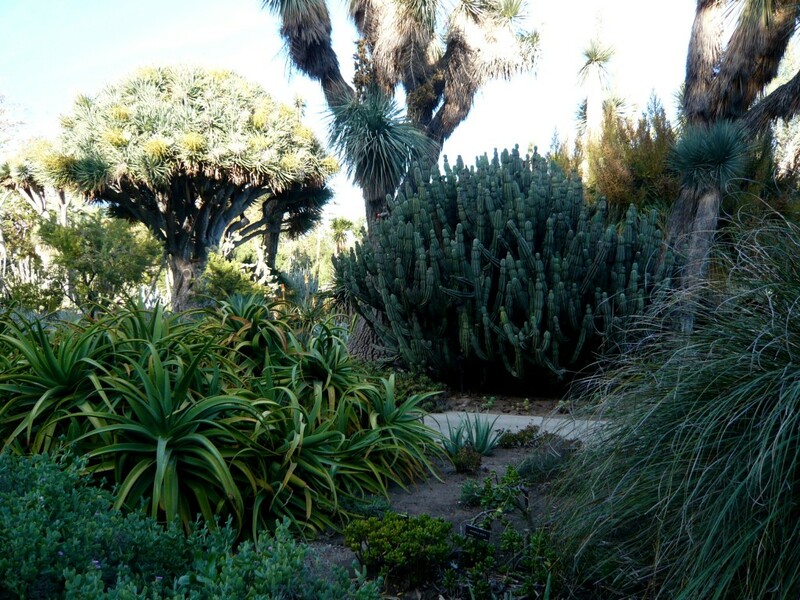 This could be a never ending post … there is so much to see and to learn about at The Huntington Desert Gardens. It is a wonderland for those of us addicted to succulents and cacti – and even if you aren’t, being in the middle of these strange giants and threatening miniatures and all manner of oddness will surely captivate you. You might not be a believer when you enter, but I’ll bet when you leave the gardens, you’ll leave a convert. You’ll want some of these monsters in YOUR garden! Oh Germi…you are so lucky to be so close to the Huntington. I was in HEAVEN! What an absolutely amazing place and yes I too wanted to move in and live there! Love your pictures…they make me so excited to start going through mine. I’m not even close yet. For some reason I feel the need to move chronologically through our travels and show everyone things in the order that I saw them so it will be a couple of weeks at least before I make it to the Huntington. Did you receive the invite from Lotusland for their special holiday bash with extra Lotusland plants available? I wish I could be there! Living 15 hours away from paradise has it’s disadvantages for sure. p.s. I keep meaning to ask you about the drawing in your header. Please tell us where it came from…your work? Or? Wow-o-wow, Germi! What a fabulous journey you’ve taken us on. I want to see Huntington NOW. 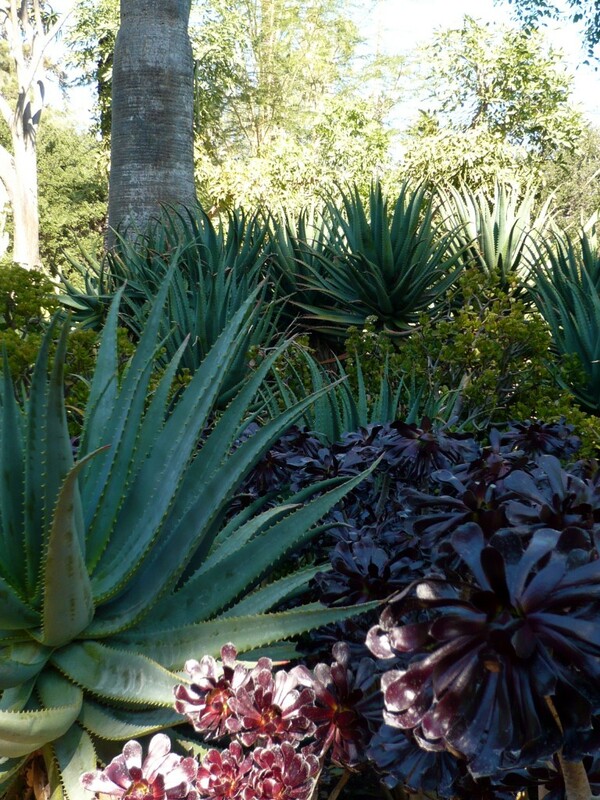 Thanks so much for the shout-out about me and my big baby, the ‘Whale’s Tongue’ agave. As you say, moving a big ‘un is not for the fainthearted. I had to wear full protective gear (heavy safari jacket, goggles, gloves, jeans), and it was in the 90s that day. Whew! But it was totally worth it to have that agave come with me. Ouch! Ouch! and Ouch!… And in the words of Anthony Bourdain “I am hungry for more”! This place is amazing! I had a meal a few years back at the Plantation Gardens restaurant in Poipu, on Kauai which had some really old, old cacti specimens…they were like buildings, you could walk inside them! Huntington looks like a similar place on a much grander scale! That first shot makes me want at least another 50 barrel cacti, but wait I need to hold back. We have not had a real bad winter for a while in Central Texas…I have a bad feeling it is on it’s frosty way. This year was the first year I have had my barrels planted directly in the ground…fingers crossed, they are in for a tough, non-covering time…(I gave up on blankets and sheets some time ago). 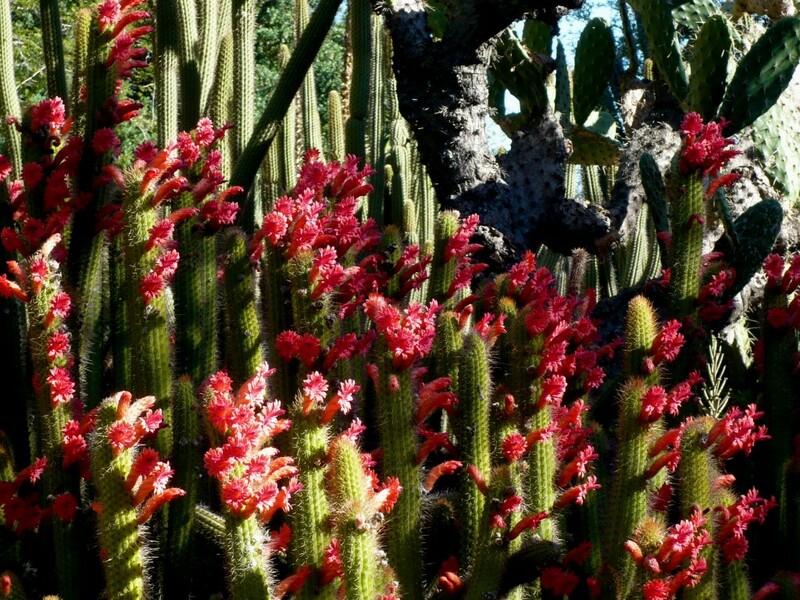 What great pictures you took of this place…the Cleistocactus, samaipatanus looks like a blooming coral reef! Yes, you would not want to have “one-too-many” and find yourself blindly stumbling around this area of the garden. You would probably just give up trying to escape and fall asleep all hung up in it like a puppet. (Deal with getting out of this in the morning syndrome). I agree watch where you plant them! Yes Germi! (rubs crystal ball) A monster garden…it is in your near destiny…I can sense it! Enjoyed the visit through your eyes. Oh, LORD! Another place I must visit before I die! I love succulents, like you. It started with DH wanting a cactus garden, and I would bring specimens home. Soon, they were MINE, mine, mine, and I had a fine collection of succulents. I do allow him to think it is his cactus garden, but really….. He does own the pepper garden, after all. Well, except for the chili pequins in my fairy garden. I will visit this garden. I will! 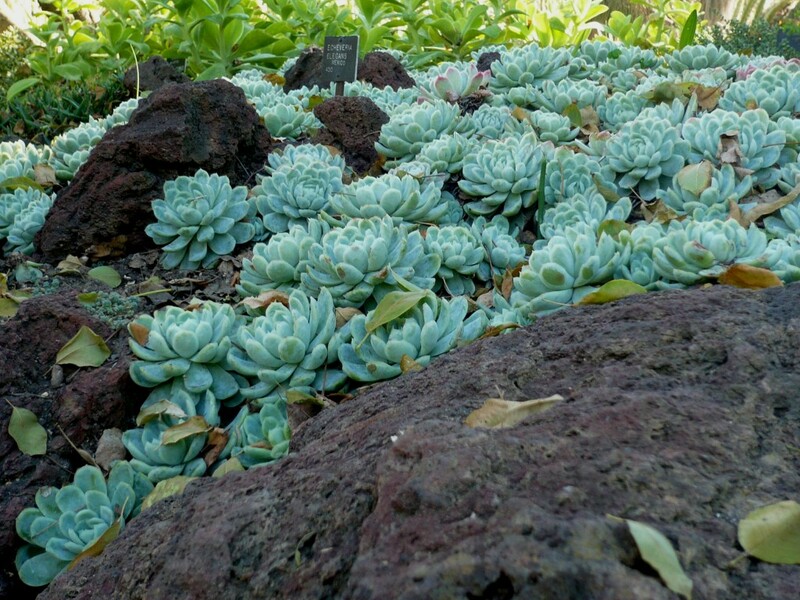 It does make me a little nostalgic for So Cal climes where succulents can grow to the scale that they have there, but then I think of all the Proteaceous stuff we can grow so well up here and it makes it a bit better! Thanks for the Germi-centric tour! Loree! I wish I could go to the Lotusland Extravaganza – but like everything these days – I have a prior commitment that reads “Mexico”! I will take ANY reason to go to Lotusland, and an EXTRAVAGANZA – I’m there! BTW – LOVED your Lotusland post! We should figure out a way to do a Lotusland blog post round up – I love reading everyone’s unique take on the fabulous place! I knew you’d love the Huntington as much as I do … it is so awesome, but in a very different way than Lotusland. LL has such a tight, specific point of view, and the Huntington is just generosity hort-style. I love both. I learn so much visiting both places, but seeing the sheer variety of succulents at the Huntington is an amazing treat. I can’t WAIT for your post!!! oh – and about my header cartoon – yes, that’s my drawing! I used to do a ‘comic strip’ for the newsletter I did for my garden club … I called it ‘Petallica’. It was all plants back talking and acting crazy … I keep wanting to resurrect it – maybe I have to do a Petallica post for the holidays! Pam! It’s so true – digging up a big agave is pure love and dedication, which is why I always think of A. ovatifolias as ‘Pam’s Agaves’! How could I NOT mention you when I saw that gorgeous specimen at the Huntington? You will LOVE it there – it is MADE for us! Yes! The Huntington is SCRUMPTIOUS! So much to see, such a wonderland! 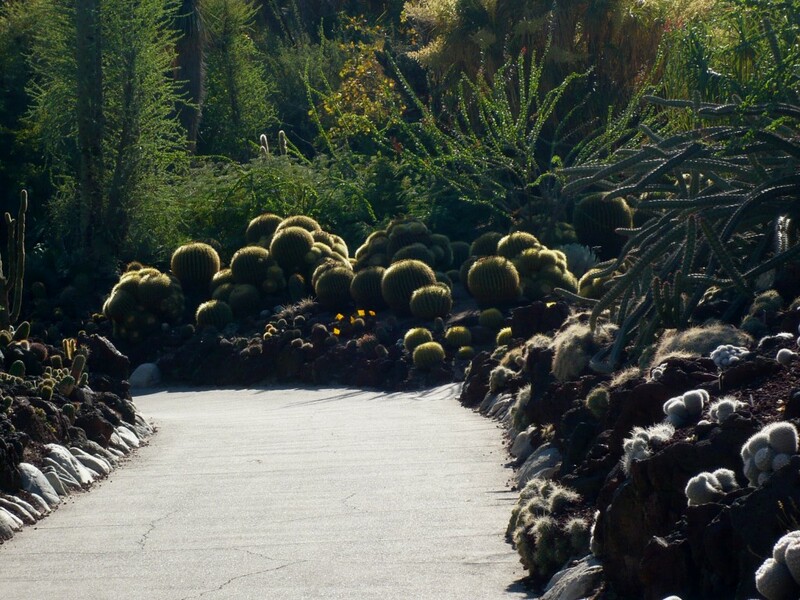 And the barrel cactus are out of control … you would be in heaven! And I know how nerve wracking it is to put something tender into ground that freezes once a decade or so – what an infernal tease! Just when we think its okay to plant whatever we want – a FREEZE!!! It happened to me 4 years ago and I lost so many beauties. But I feel myself relaxing… as far as the almanac goes, I have 15 years until the next big LA freeze … I am crossing my fingers for you! But don’t get rid of your plant blankies! Just in case! And having YOU like my pictures! HIGH PRAISE! Because you and Pam are my garden photo gurus, you know. And, considering my fondness for the nectar of the agave (meaning tequila, not that honey-replacement stuff), I shall plant all cleistocactus in a spot far from where I do my nighttime wanderings. Or I WILL be impaled. Exactly as you describe! It’s called a bedroom community because there’s nothing to do there but sleep; people work downtown and If it has a garden like this, I’d say it’s a bit beyond a bedroom community. In any case, a wonderful virtual tour! A bunch of friends and I got into a hot debate (in more ways than one) about whether or not Mamillarias really looked like breasts, you know, with all the spines. My last word was, well, you can look but you can’t touch! Oh.. oh…oh, I’m blissed out. You’ve pictured in myriad.. glorious..eye-popping detail & miraculous botanical beauty one of my very favorite places on earth (as far as I’ve managed to trek!). And so, despite my inability to make it back to the Huntington on my recent trip, you read my mind!!!! Providing me with a perfectly presented tour that’s the closest thing to my having strolled the paths of this cactus/succulent garden in San Marino. I grew up within a few miles of the Huntington and took many amazing trips there–Thanks for the reminder! It’s been too many years since I was there last, and now they have a new museum wing and a Chinese garden that I’ve never seen. I like your idea of a monster garden. Throw in some carnivorous plants and you’ll have a stunning B-movie set. Thank you for lovingly writing about these often snubbed plants. I am mad about my own succulents and cacti however mine do not come near your extensive collection. Keep spreading the good word!